The winners will be announced in the News section or here. This competition is dedicated to all tipsters that made an account through us at betboro.com and want to support bettors.club. We want to reward those tipsters with bonus prizes for their support. 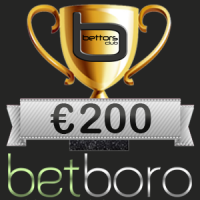 The bonus prize pool is €200 and all prizes for this competition will be rewarded in the tipster’s betboro.com. Besides the bettors.club Tipster Competition, all tipsters will automatically participate in the betboro tipster competition. The rules are the same, the only difference is the prizes and the way we choose the winners. 3.8.Picks without a description are counted for this competition. 1.Players must deposit at least €20 during the competition month. 2.Players must place a minimum of 1 real bet during the competition month. *betboro reserves the right to deny any promotion offer for any customer for whatsoever reason. It might be breach of terms and conditions, shared IP/Devices, abuse of the promotions etc. IMPORTANT: To have receive the prize you must open an account through bettors.club. Click here to open a new account. -Unfortunately betboro bonuses will not be given to the following countries: India, Pakistan, Bangladesh, Indonesia, Malaysia and all African countries. Hello, may I cooperate with you? I am in China.. I hope you can sell me the results of your analysis.